During the 1960s and early 1970s, Japanese avant-garde filmmakers intensely explored the shifting role of the image in political activism and media events. Known as the “season of politics,” the era was filled with widely covered dramatic events from hijackings and hostage crises to student protests. This season of politics was, Yuriko Furuhata argues, the season of image politics. Well-known directors, including Oshima Nagisa, Matsumoto Toshio, Wakamatsu Kōji, and Adachi Masao, appropriated the sensationalized media coverage of current events, turning news stories into material for timely critique and intermedial experimentation. 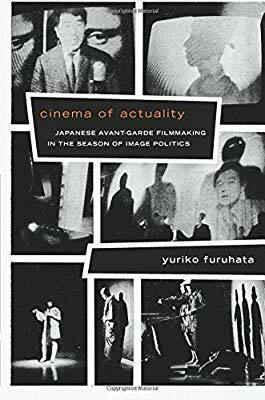 Cinema of Actuality analyzes Japanese avant-garde filmmakers’ struggle to radicalize cinema in light of the intensifying politics of spectacle and a rapidly changing media environment, one that was increasingly dominated by television. Furuhata demonstrates how avant-garde filmmaking intersected with media history, and how sophisticated debates about film theory emerged out of dialogues with photography, television, and other visual arts.